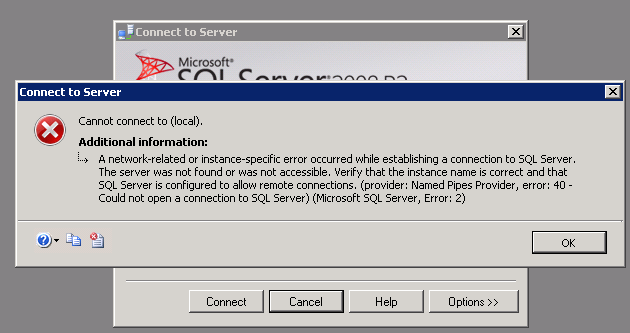 Error when attempting to log into SQL Server Management Studio: "Cannot connect to (local)." Verify the correct protocols are configured (this will vary based on type of environment). Refer to Microsoft TechNet article, Choosing a Network Protocol, for further assistance with this topic. 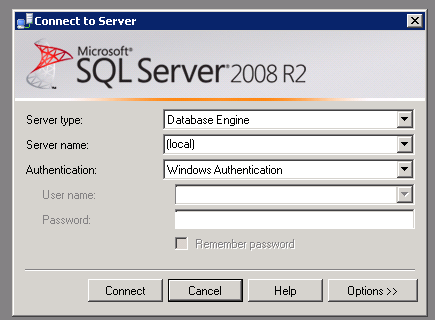 Verify that the SQL Server (MSSQLServer) Service is running. If it is not running, try to start it. Make sure the Service Account credentials are properly configured and that the account is not locked out. Microsoft TechNet (August, 2011). Choosing a Network Protocol. Retrieved August 29, 2011 from http://technet.microsoft.com/en-us/library/ms187892.aspx.